Every year in the past 20+ years that I've made wings, I've created a new Spring Line of Wings to Wear. This year, because it's Spoutwood Farm's 25th Anniversary May Day Fairie Festival (visit spoutwood.org/fairiefestival/2016-fairie-festival-april-29th-may-1st), I've come out of Wing retirement to add my artistic voice to the festivities! This year's festival theme is Reflections: Mirrors, Windows and Portals. I've taken these concepts to heart, making one-of-a-kind wings that have a direct connection to these notions. 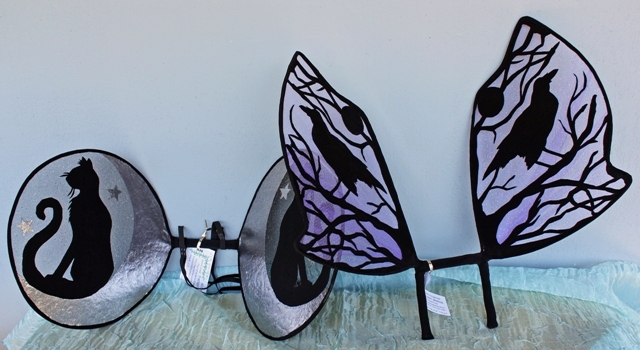 All of these wings incorporate reflective and shiny fabrics and are made using my tried and true sturdy method for long, comfortable wear, perfect for lots of imaginative fun. The wings to the left are my Portal Window Wings. I had so much fun making these, locating the perfect bird, butterfly and bee fabric to use as curtains. As you glance through the windows you can almost spy a Shire-ling in the garden! These are truly unique! Stop by my booth next to the Farmhouse at Spoutwood Fairie Festival and see them before they're all gone! I could image each being in an illustration in an old storybook. 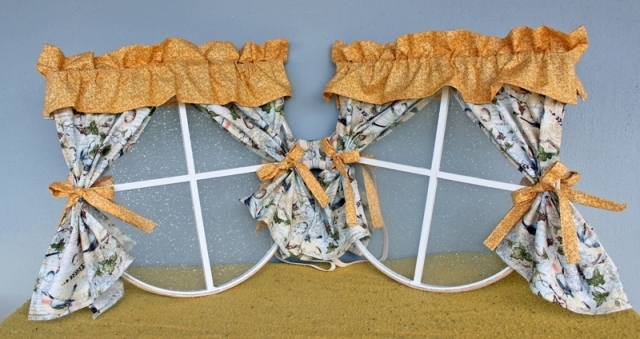 Each set of wings has my own unique design cut out of fabric and they contain images that tell their own story. 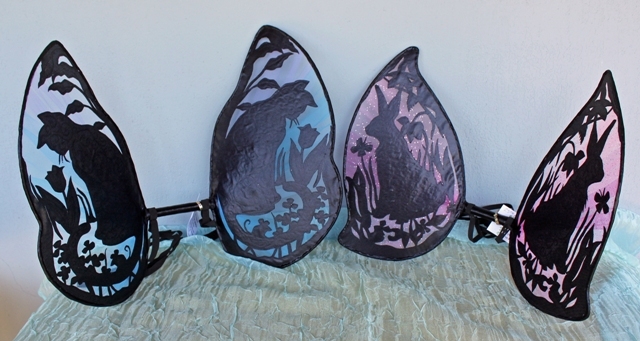 Prices: start at $180, 12" - 15" H.
These were my first Woodblock Inspired Wings made this year. 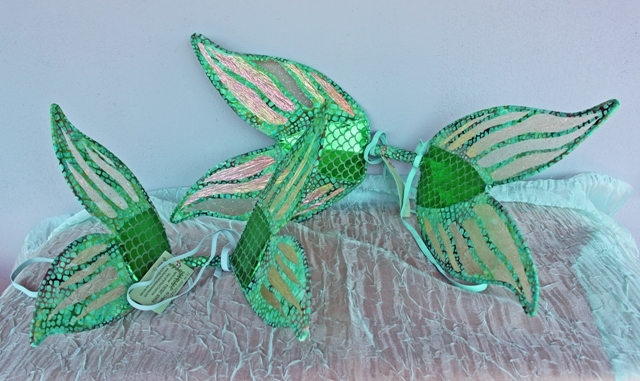 I've created several more of these type wings, all with original designs. The Raven Wings are made for bodices with 'pegs' (to insert into the back of the bodice). All of these wings can be adapted to wear with elastic arm straps. Prices: start at $150, 12" X 16" H.